Disclosure: I received a product to sample, no monetary compensation took place. All opinions stated are genuine and my own. For Mother's Day I had a canvas made for my mom of my four kids (her only grandchildren). I loved it so much it was hard to wrap it up and give it away. Luckily, it was for my mom, and that took precedence over me wanting to keep it. To be honest, the canvas we received was a wee bit little lighter than I would have liked it to be, and the quality of the photo uploaded was a professional one (copyrighted CD from the photographer), but it still looks great on the wall, and so much nicer than just a traditional framed photo. We've got it hanging right when you walk in the house and people always notice it favorably. When your kids start getting older, and move out, get married, etc., it's harder to get a picture of them together than it is when they're young. Last year for Christmas, my oldest and his wife thought a photo shoot would be a great gift idea for me (they were right! ), and this was one of the pictures that came from that day. I'm so happy to have it now on canvas! Easy Canvas Prints wears their name well, the process to create this canvas was, well, easy! There are some great options too, for finishing your canvas. You can choose your wrap, I chose to wrap mine in black (around the sides). There were other colors though, and more options including a mirror wrap that was fun. There were also options for touch-up, framing, etc. The service is fully customizable and does allow you to create a print that is very personalized to your own taste. Would I use Easy Canvas Prints again? Absolutely. You can also follow them on Facebook and/or Twitter. If you use Instagram, you can also transfer photos from it to create a custom made canvas (very cool). 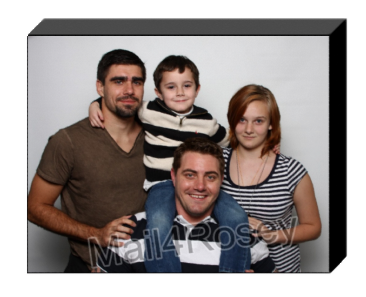 One lucky Mail4Rosey winner is going to get to create an 8x10 canvas of their own. US entrants only. What a fun picture! I bet you are really enjoying having it up at your house. Have I told you yet how beautiful your family is? I am sure you know that already though ;) I think the canvas turned out so nice! I went with the solid colors on the edges of mine too. I thought that was fun trying to decide what color would look best on the canvas. Thanks for the compliment, Theresa. I thought it was fun to choose the side colors too, and kept trying them out even when I knew I was going with black. Looks great - just stopping by to say hello and wish you a wonderful weekend friend. Saying hello back. Happy weekend, Sandie! It turned out looking great! I've always wondering about canvas prints? It does seem like a lovely gift idea. Thanks for sharing. My mom LOVED hers! It is a nice gift idea. Thanks for visiting, Monica. I was curious what they looked like with a border color! Love it! I need to make more of these and move from digital to print. Digital makes it so easy to get lost (so much stored, not enough printed!). that is such an awesome picture of your babes! i LOVE it!! I have a canvas from them and it is great. Thanks for the giveaway!